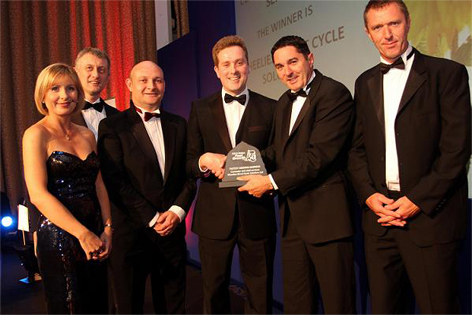 Cycle Solutions has scooped a top award at the Wales Fast Growth 50 event held in Cardiff on Friday 16th September. Cycle Solutions promotes cycling and its benefits, through the tax efficient cycle to work scheme. The salary sacrifice scheme enables employees to save as much as 51% from the equivalent retail cost of bicycles and cycling accessories. The Fast Growth 50 awards are one of the most prestigious events of the Welsh business calendar and Cycle Solutions was recognised for securing turnover growth of 289.5% between 2008 and 2010, making the Company the fastest growing Welsh business in the consumer and retail services sector. Cycle Solutions was formed in 2006 and since then has forged successful relationships with over 700 employers across the UK. Some notable clients include London Borough of Hammersmith & Fulham, West Midland Fire Service and the Football Association. “We have seen businesses and public sector employers from all over the UK joining the scheme in the past 3-years, and we continue to see a growth in interest in the scheme from employers and employees alike ”commented Edgell.